Everyone knows it, but you really only notice it when you’re there: the USA is truly a very young country, and this is nowhere so apparent as in the dates things were founded. So one of the country’s most important opera companies is just under 50 years old! Seattle Opera was founded in 1963; the Ring (given at first in English translation) made it a pilgrimage destination for Wagner fans, and today it’s responsible for the reputation of Seattle as a cultural hotspot in the Northwest of the United States. Next year, for its 50th anniversary, the Opera will mount the Ring. 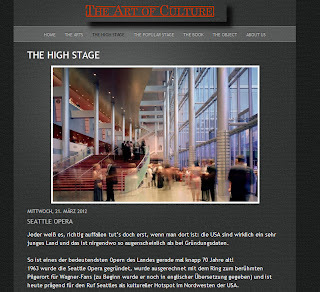 Such mammoth productions have become more difficult in this time of economic crisis, primarily because the Seattle Opera – as is customary in the USA—is primarily financed by private sponsors. How extensively, you can read in the program; it ranges from sponsoring individual singers or dancers to set and props. The repertoire of Seattle Opera can’t keep up with that of the Met in New York or its European counterparts. Current productions are given on only a few days a month—but these happen at the highest level, with exceptional programs framing the performance. At the end of February and beginning of March 2012, for six performances, it was the French version of Christoph Willibald Gluck's Orpheus and Eurydice from the year 1774. The Opera produced it entirely "in-house" - sets, costumes, props, everything its own production. The staging is exactly how one presents an opera in an upscale, "American-style": artistic at the highest level, but largely without modern interpretation or level of abstraction. Wicked tongues may say that the sponsorship system stipulates that only pleasing operas are produced, that no important contemporary questions can be asked. But you can of course counter [this suggestion] with whether modern productions in Germany, or even Europe, which are much less dependent on the favor of sponsors, but instead can count on independent government money, always add value—or do they just provoke the audience? With Orpheus and Eurydice in Seattle at least, a funeral march is still a funeral march, the underworld is still the underworld, love still love and a harp still a harp. Then, you might wish there were more courage to take the presentation a bit further, but it’s nice to look at this elegantly reduced stage picture, sometimes resembling Japanese silhouettes; and also the ballet incorporated as part of the opera- in particular the spirits of the underworld – with their shudder-worthy hooded dance costumes, which make the highest claims for contemporary dance. The singers are completely convincing when it comes to meeting audience expectations, although on our visit the great William Burden, who’d been announced, could not perform as Orpheus in the short term due to an indisposition. He was replaced by the young Andrew Stenson, who had previously never taken a larger solo role in an opera, and now deserved no less a triumph than Burden had before. Without any sign of uncertainty, and with the utmost professionalism, for Stenson [it was] certainly a career advance. Even the piquant interplay with Davinia Rodriguez' Eurydice, who doubts Orpheus' love, may convince us who know better. Granted, it is simply beautiful to sit back and listen to and watch these two vocally secure and solid lovers on this "unadulterated" stage set. Feel Good Opera. As a relieving interlude, Julianne Gearhart as a bike-riding Amour -- a bit, but not too frivolous, with whom everything just sparkles and glistens. He makes his jokes with mortals, but is kind-hearted and cannot himself tolerate the unfortunate consequences of his actions - he wakes Eurydice up again, after Orpheus believed he had lost her forever because he looked at her, out of love. Gluck wanted to return so closely to the "real" and "authentic" operatic form of a Monteverdi - away from the Baroque utterances of a Handel – that of course the happy ending is completely fake. It takes the mythical story of Orpheus and Eurydice into absurdity and robs them of their heartbreaking and truly inevitable tragedy. This is of course not questioned in the Seattle production or even addressed. The next production, for the end of April, will be Madama Butterfly and one can imagine, what that will be: traditionalism at its best. 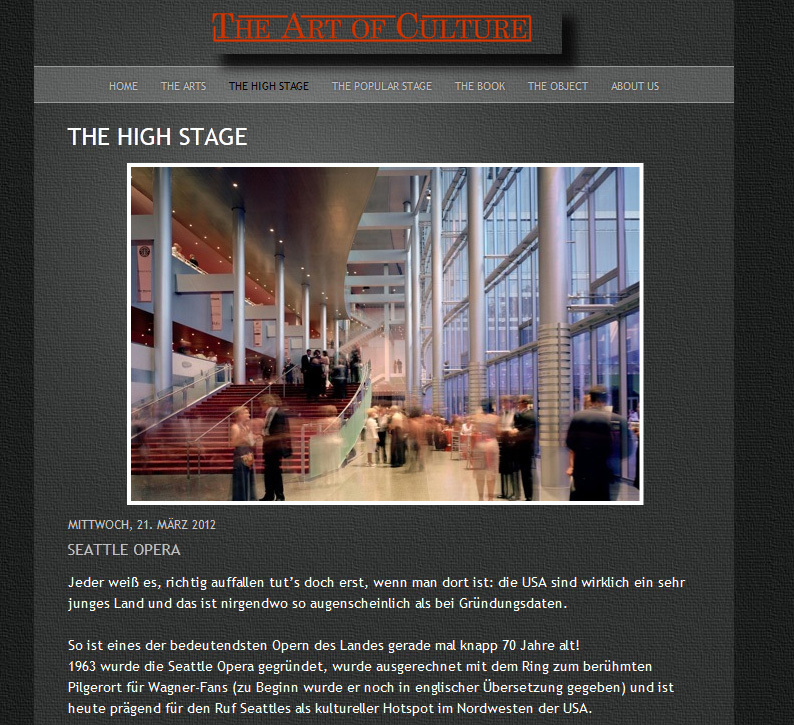 The very easy and open access which Seattle Opera offers its audience and interested parties is remarkable. This also includes the afore-mentioned obvious and omni-present sponsorship. For just $75 a year, you purchase a “Pearl” membership and enjoy a few advantages, whereas at $50,000 you are at the "Gold" level and may dine with the General Director and the stars of each new production - and of course each (!) sponsor is published in a handbook. High ticket prices are therefore extremely common, and extra tables are supplied in the opera house for those who bring along an opera picnic. The introduction before each performance is standard, and afterwards a Q & A with the General Director himself, in person, takes place, answering the audience’s questions with a friendly American intimacy – can anyone imagine that happening in Munich with Klaus Bachler? Naturally there is also an opera camp for kids – after all, future sponsors will be urgently needed. By the way, McCaw Hall, the completely renovated opera house newly opened in 2003, implements this wonderfully open access visually, with its chic glass façade, airy and bright interior, and open structure. If you have tickets for Bayreuth, be a bit crazy, sell them and fly next year for the Ring to Seattle—you will be impressed, and not only by the more comfortable seats!